Located in Hot Springs, RV and Tent camping as well as Tipi lodging. Overnight Horsepack trip also offered. Beaver Lake Campground has family camping and spacious level shaded sites, from the largest RV's to the smallest tents. Don't have a tent or RV? Then choose from one of our Camping Cabins or Tipi's. Camping and RV pull-throughs. Stocked fishing pond, Restaurant and bar, entertainment and games on site! We are a beautiful resort centrally located between Mt. Rushmore and Crazy Horse Mountain. Great cell service! Awesome Cabins! Amazing RV Sites. A quiet little campground near Spearfish, South Dakota. Cabin rentals, RV and Tent sites in Deadwood South Dakota. Outdoor adventures are plentiful at this lovely resort. Cabins, motel rooms as well as RV and camping sites. Wildlife watching, fishing, golfing and more. RV sites, tent camping and camping cabins available. This spot makes for the perfect Black Hills getaway spot for all ages. Plenty of recreational opportunities. A great RV Park and Campground in Custer, South Dakota. Days End Campground has RV sites and cabins for an unforgettable Black Hills vacation at any time of year. Showers, laundry, dump station, WiFi available. Known for our scenic view and great value, we are your best choice for your stay during the Sturgis Rally and Races. 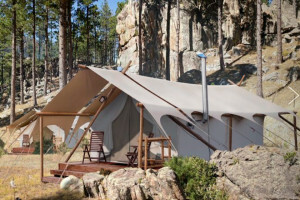 Experience the best in family camping in Custer, South Dakota. Easy access to all the sights in the Black Hills. Full hookups, shaded tent sites. Flintstones Theme Park and Campground is truly great for all ages, and the kids love it! Cabins, full hookups, tent camping. Heated pool, showers, hiking. RV facilities, camping and entertainment, all rolled into one ideal camping resort. Sturgis, South Dakota offers all the best in a vacation adventure. Terrific vacation spot on a 13,000-acre working ranch. Cabins and RV hookups. Outdoor pool and kids pool. WiFi and other wonderful amenities! Cabins and campground in the Black Hills National Forest. A peaceful haven for horse lovers, bicyclists, and hikers. A campground and RV Park only a short drive from many Black Hills attractions. Large sites! Cable TV, pool, hot tub, hot showers and more. Tent and RV camping in the pristine beauty of the Black Hills. A quiet paradise off the beaten path. Enjoy many adventures and discoveries. In a quiet side of Sturgis, this is a great campground for peace and quiet with easy access to the Black Hills. Settle in close to the Black Hills wonders at the campground in Battle Creek Canyon. Lovely cabins, great RV and tent sites. Plenty of scenery. The quality and service of a KOA campground at Custer South Dakota. Take your pick among RV sites, beautifully shaded tent sites, one to three-bedroom cottages or luxurious two-story vacation homes. Bike path, recreation field. Country camping with city-style amenities. Tent camping, sites for trailers, campers and RVs of all sizes. Showers, laundry, restrooms. Near a wide variety of attractions. Campsites and cabin rentals are available on this Hill City property right next door to National Forest service trails. Tucked into the woods, we offer cabins, campsites, restaurant, ATV, UTV, and Snowmobile Rentals. Located right next to the trail system. Off Hwy 385. A full-service resort offering tent, RV sites and cabins in the beautiful Black Hills. Pull-through sites with picnic tables. Cabins have cable TV, kitchenettes. Enjoy comfortable rooms, cabins and great RV Park at Recreation Springs Resort. Endless outdoor activities and the ideal Black Hills vacation await you. Located near Rapid City. RV, tent and cabin sites. Showers, laundry, hot tub, swimming pool. Full hookup RV sites and showers, laundry and restrooms. Famous Black Hills sights nearby. Just six miles south of Deadwood. Great getaway spot. Sturgis RV Park offers clean, modern, well-maintained facilities tailored to suit any RV, trailer, or tent camper. Full RV hookups, tent camping & log cabin rentals. Minutes from Sturgis & Rapid City and easy access to Mt Rushmore and other Black Hills attraction. Located directly between Deadwood and Mount Rushmore, they offer a vacation home rental, rustic cabins, and a spacious RV park and campground. The perfect place for a home base on your Black Hills getaway. In Deadwood, South Dakota, this RV Park and campground has swimming pool, showers. Family camping has never been better in the pines with brooks tumbling nearby. Cabins, spacious tent sites. Free showers, free WiFi, playground, arcade, deck, fireplace. Shaded RV and tent camping on the river. This Black Hills campground even serves hot breakfasts and homemade dinners during the famous Sturgis Rally.